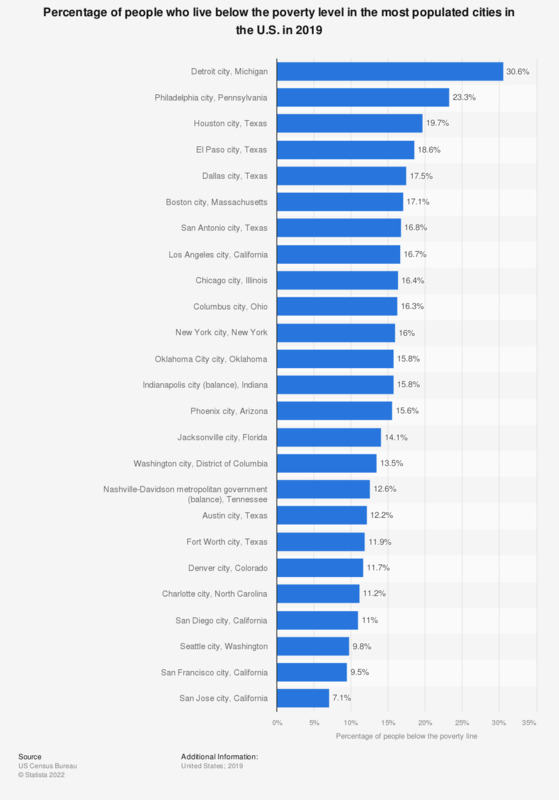 This statistic shows the percentage of people who live below the poverty level in the top 25 most populated cities in the U.S. in 2017. In 2017, total 34.5 percent of all residents in Detroit, Michigan lived below the poverty level. The poverty threshold, or poverty line, is the minimum level of income deemed necessary to achieve an adequate standard of living in a given country. In practice, like the definition of poverty, the official or common understanding of the poverty line is significantly higher in developed countries than in developing countries. Everything On "Homelessness in the U.S." in One Document: Edited and Divided into Handy Chapters. Including Detailed References.